While 89% of women are open to trying out new beauty brands and products, existing brand loyalty remains influential when women consider which beauty products to purchase. 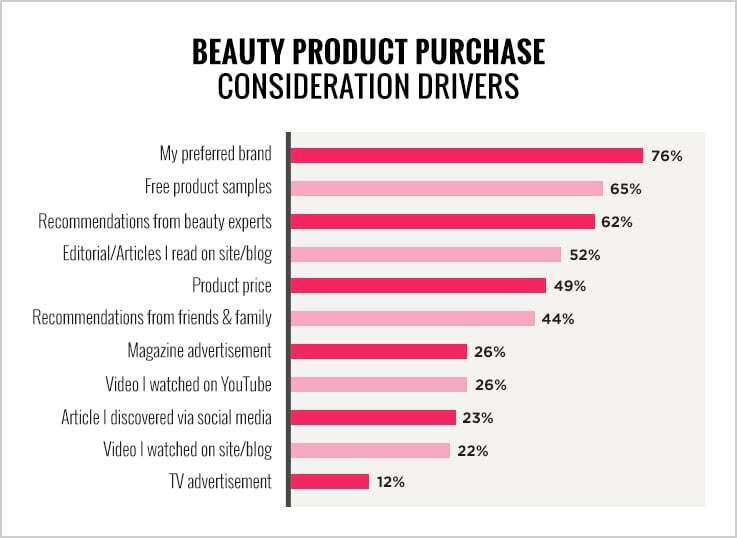 As part of the POPSUGAR Insights Q2 2014 beauty study, we asked women to tell us the factors that they find most influential when they are considering the purchase of a beauty product. Overall, 76% of women say that their preferred brand is the No. 1 most influential factor they consider when shopping for beauty products. Women have established beauty rituals, and while they are open to change, it's easy to understand why women would prefer to stick with trusted brands until persuaded otherwise. Sixty-five percent of women are perhaps more open to change or don't have established routines and therefore find that product samples are most influential when they're shopping for beauty products. Recommendations are also highly influential to women, with advice from beauty experts (62%), editors or bloggers (52%), and peers (44%) ranking highly. Price is also a determining factor when it comes to purchasing beauty products. Women don't have unlimited budgets, so 49% of women feel that price influences their final decision. Finally, content can be an influential source of information for women. Twenty-six percent of women feel that YouTube videos are influential when it comes to deciding what to purchase, and 23% of women are influenced by articles they discover via social media. Only 12% of women are swayed by advertisements they see on TV.